Located in coastal Georgia, Southern Soul BBQ is close enough to the Carolinas and the Deep South to pull from both BBQ traditions. 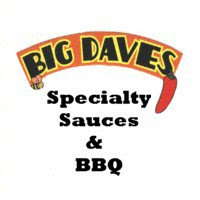 This mix of influences is evident in their varied lineup of BBQ sauces. Southern Soul produces a South Carolina mustard sauce (Low Country Soul) a sweet, thick tomato sauce as well as their North Carolina inspired Red Swine Wine. Red Swine Wine is a recipe right out of the heart of North Carolina. Similar vinegar based sauces can be found all over the central and western parts of the state. To distilled vinegar, Red Swine Wine adds tomato paste, sugar, salt and spices to create their tangy concoction. In my neck of the woods (Piedmont region of North Carolina) this type of sauce is referred to as a "Lexington Dip" in honor of North Carolina's BBQ capital. Though the cool blue Southern Soul label says that Red Swine Wine can enhance any grilled or smoked protein, there's really only one appropriate use for a sauce like this. It was made for hickory smoked pork shoulder. Thankfully, my freezer is fully stocked with an array of meats that I have smoked and vacuum sealed. I pulled out a package of chopped pork, made up some creamy slaw and put together a couple of man sized sandwiches for dinner. It's too bad the pictures didn't turn out because these things were loaded! I gave each sandwich a healthy shot of Red Swine Wine. The tangy vinegar is something that has become very familiar to me. My tastes have evolved since moving to North Carolina and I've come to really enjoy these types of sauces with smokey pork. 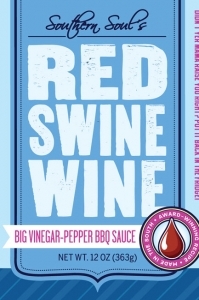 Red Swine Wine has a spicy pepper finish that is a bit more intense than the typical Lexington style sauce. While it's not uncommon for Lexington Dips to feature crushed red peppers, Southern Soul takes the spice level up a couple of notches. It's not "HOT", but it still has a nice bite. Vinegar dips are completely foreign to the majority in this country. Introducing a Midwesterner to Red Swine Wine would definitely be dropping them in the deep end of the vinegar pool. However, for those will to broaden their horizons, Red Swine Wine is a Lexington Dip done the right way. Even the most staunch Carolina BBQ traditionalist could appreciate what these Georgia boys are doing. 0 Response to "Southern Soul BBQ Red Swine Wine"